Not every memory against the Seahawks has been bad for Dallas. Just one really bad one. The Cowboys and Seahawks aren't bitter rivals, but a Dallas win on Saturday night would certainly avenge a few recent bad memories – and one REALLY bad memory – in the series between the two teams. Let's take a look back at the some of the highlights (and lowlights) of the Cowboys' matchups with Seattle, going back to their first meeting in 1976. 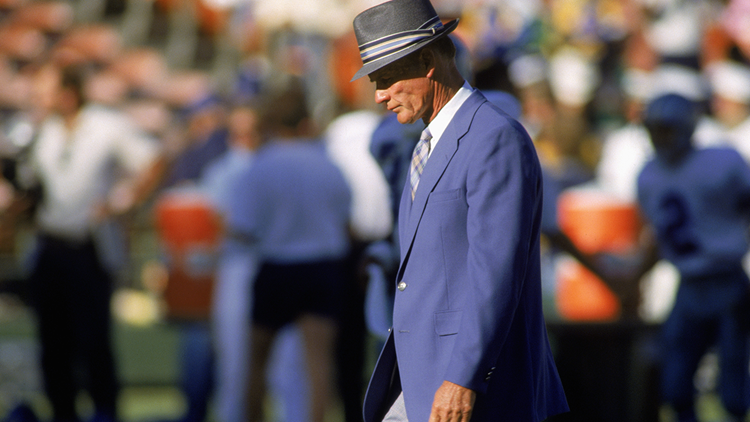 The Cowboys dynasty of the 1970s was no match for an up-and-coming Seahawks franchise. When Dallas traveled to Seattle on Oct. 3, 1976 during the Seahawks' inaugural year, Roger Staubach and Co. won comfortably, 28-13. The Seahawks would go on to finish 2-12, while the Cowboys won the NFC East at 11-3 (but lost in the first round of the playoffs). A few years later, in 1980, with Danny White at quarterback, Dallas blew out the Seahawks at home, 51-7. In 1983, Dallas beat Seattle 35-10 on the road. The early 2000s were lean times for the Cowboys. With Troy Aikman and Michael Irvin retired and coach Dave Campo mired in 5-11 seasons, the franchise's 90s dynasty was long gone. But for at least one afternoon, Emmitt Smith, then in his final year with Dallas, gave Cowboys fans something to remember. Smith's 11-yard run up the middle on Oct. 27, 2002 – against the Seahawks – broke Walter Payton's all-time NFL rushing record. The Cowboys lost the game on a fourth-quarter field goal, but Smith's record-breaker was the moment of the day. Sorry, we had to do it. No one, not even the most diehard Dallas supporters, can think about playing the Seahawks, especially in the playoffs, without thinking of Tony Romo's toughest moment as a Cowboy. On Jan. 6, 2007, with Dallas trailing 21-20 at Seattle in the first round of the playoffs, Romo had marched the offense to within the five-yard-line, where they needed a chip-shot field goal to win the game. Then, something went terribly wrong. Romo, who was also serving duty as the holder on field goals, botched the snap. He tried to scramble for the touchdown but was brought down short of the goal line. Sports Illustrated later called it the "botch heard 'round the world." If the strong Cowboys teams of the 70s and early 80s controlled the series in those days, it's been the strong Seahawks teams that have had the advantage since 2012. Seattle beat Dallas 24-13 in September and won 21-12 in December 2017, their last trip to AT&T Stadium. The Seahawks also notched a 13-12 win (on a late field goal) at Dallas in 2015 and a 27-7 win at home in 2012. Dallas did manage to score a 30-23 win at Seattle in 2014.